These oven roasted radishes with rosemary and honey are a simple way to prepare radishes and mellow out their intense flavor. A great spring side dish! *This post for roasted radishes was originally published 6/12/2012. Pictures have been updated and a video has been added below to show you how easy this great spring dish is to make. Some content below has been updated as well. Try to forget you just read that title and tell me what these look like. Betcha wouldn’t say radishes. Probably those cute little red and white potatoes that cost 5 times the amount of normal ones popped into your head first, right? I finally joined a CSA this year after talking about it for at least 3 years. I kept waiting for Ulysses to tell me it was a great idea or for some other outside factor to push me along in my decision making process that shockingly, never happened. The day my husband willingly encourages me to spend $900 on fruits and vegetables will be the day pigs fly. So when Brandy suggested splitting a share this year, I said yes without even bothering with spousal consult. So far, the CSA has been great for forcing me to cook with things I don’t normally buy. I don’t exactly love them raw. They’re just a little too peppery and crunchy for me (although combine them with prosciutto in this peach and radish salad and I can be persuaded). Then there’s the whole bit of their little tails. Anyone else think they look alarmingly like sperm because of those things or is it just me? When you cut off their tails and ugly brown spots though they look a heck of a lot like small potatoes. So, I decided to treat them like potatoes and do what I do 99% of the time – roast them. This roasted radish recipe brings a little more flavor than a basic recipe though by using chopped fresh rosemary and some honey. The honey is the only ingredient keeping this recipe from being vegan though so if you want to go that route, feel free to omit it or replace it with either agave or maple syrup. I do really like the hint of sweetness it brings to the radishes so I would suggest replacing rather than omitting. The cleaned radishes get tossed with the olive oil, salt, rosemary and honey on a large baking sheet and roasted at 425°F for about 30 minutes. Make sure to toss them 1-2 times while cooking so all sides get nice and crispy and nothing burns. What Do Roasted Radishes Taste Like? 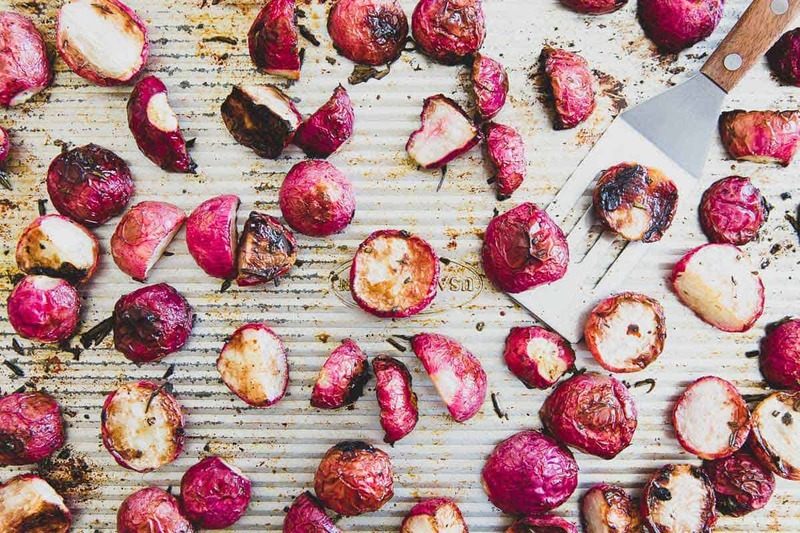 Here’s what I love about roasting radishes – it completely transforms the flavor. That intensely peppery bite they have when raw gets majorly tamed through roasting and they not only resemble potatoes in appearance, they sort of taste like a roasted potato too. A slightly more watery/less creamy potato but definitely more potato than radish! Oven roasted radishes are much more mellow with a pleasing flavor I just can’t say the same about when raw. They’re a root vegetable after all and when it comes to root vegetables, 99% of the time I find roasting them to be my preparation of choice, radishes are no different. Do I Need To Peel Radishes? They may look like beets but no, you don’t have to peel radishes to roast them. The whole vegetable is edible! 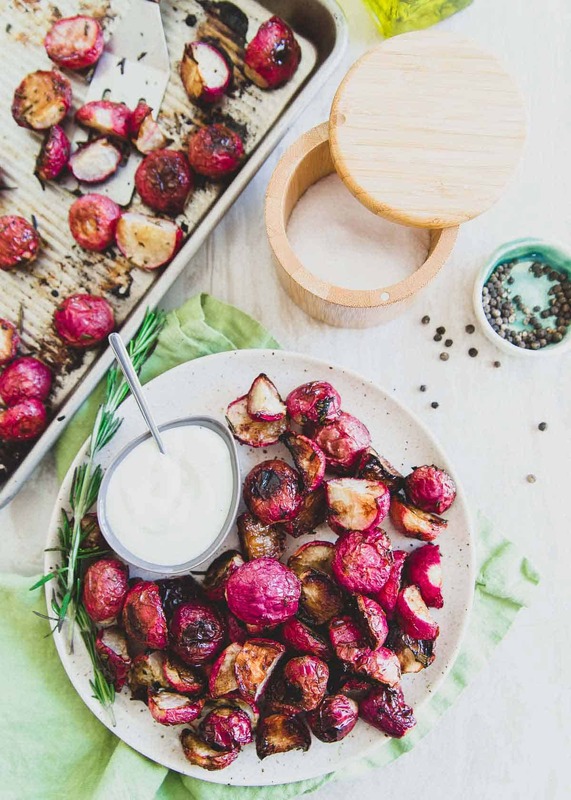 How Do I Eat Roasted Radishes? Roasting the radishes like this they become the perfect side dish to lots of different meals. You could serve them alongside a steak (maybe this rosemary garlic flank steak?) instead of potatoes for a lower-carb option. Side note – radishes are great for low-carb eating as they lack the starch that many other root vegetables have. I also feel like this rosemary roasted radish recipe is a great stand alone appetizer! How many times do you see crispy Brussels sprouts on an appetizer menu in a restaurant? Usually paired with an aioli of some sort, right? 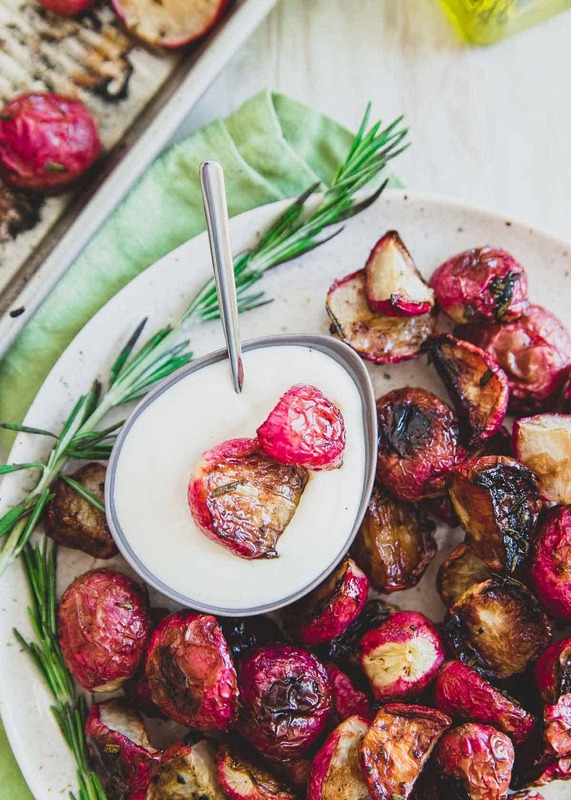 I don’t see why roasted radishes especially these with rosemary and honey can’t be the next Brussels sprout appetizer! The tangy Greek yogurt dipping sauce made with dijon and honey mustard and a squeeze of lemon juice makes these crispy roasted radishes totally appetizer worthy. Second to asparagus, radishes signify spring to me. After a long NY winter, I’ll take any bright and fresh produce I can get! 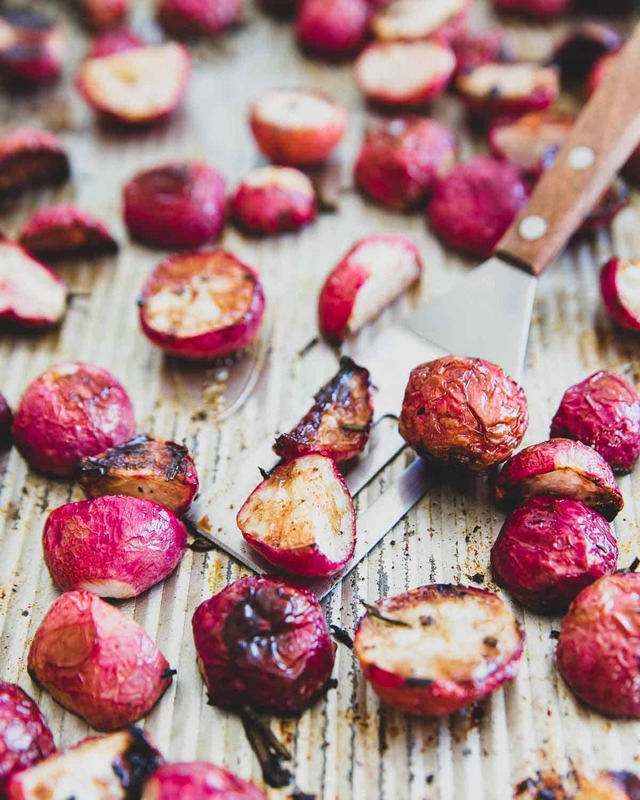 This recipe for roasted radishes would be a great one to consider for your Easter plans. Alongside a ham (don’t miss 3 ways to use leftover Easter ham!) or whatever roast your family makes (we’re usually lamb or pork people) for the holiday. With the radish CSA challenge down, I’m ready for the next one which might be taming the crazy garlic scapes in my fridge (they’re huge!) into something edible like this garlic scape pesto. It’s sort of fun to cook with the seasons like this, makes you really think about and appreciate each and every ingredient. Don’t miss this Spring Pea and Radish Risotto if you’re looking for more ways to enjoy radishes. Preheat oven to 425 degrees. Grease a baking sheet with cooking spray. Place radishes on the baking sheet and toss with olive oil, salt, rosemary and honey. Roast for 30-35 minutes, stirring occasionally so they cook evenly and don't burn. Remove from oven when wrinkled with a crispy exterior and soft interior. Combine all ingredients in a small bowl and stir together until mixed. I got some radishes from the CSA, and I hate to say it, but they don’t feel firm. I’m thinking making your recipe will make them firm up being cooked. I’m going to do that today! Great recipe and I honestly never heard of roasting radishes!! Thank you!! Glad I won’t waste my radishes! To Jennifer — if your CSA radishes didn’t feel firm, they were either picked too late or stored improperly (or for too long) before you got them in your share & home. I look forward to trying the recipe! Looks like a potential hit with some of my picky eaters. And anything with rosemary & olive oil HAS to be great! Great idea on roasting the radishes. Even better is making yourself think you are having a starch. I saw the picture before I read the title and said, Potatoes! LOL I have a bag of radishes on hand. I will give this a try. Looks really good. Never would have thought of roasting radishes!!! Amazing idea! I’m not a big fan of them raw either, can’t wait to try this! I LOVE radishes…peppery and crunchy in all the right ways for me! :) I’ll admit this recipe took me aback at first but I’m so intrigued I might just try it! Gina!! Awesome idea – I’ve been wondering what to do with the radishes in my fridge, aside from letting them rot. What a great thing to do with radishes! My carb-loving mind works in the same way as yours so I like the idea of fooling it with these. couldn’t have been better timing as I bought some radishes at the farmers market just last night without a clue what I was going to do with them. Obviously I’ll now be roasting them, so thank you! Hahaha…I’ve never thought of radishes looking like sperm, but oh my GOD they do!!! 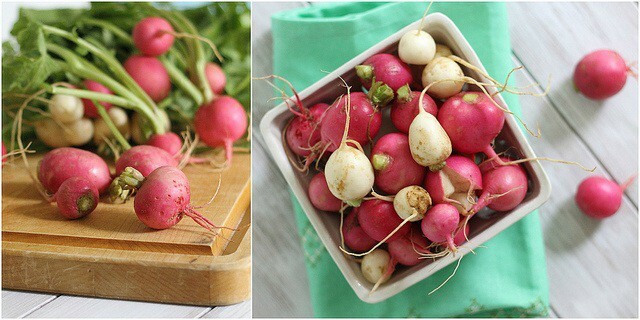 I’ve never ever thought to roast radishes–and I’m jealous of your CSA split! I’ve been hesitant to commit to one as well but splitting is a great option. I definitely thought those were potatoes! I’ve never thought to roast radishes but they look pretty delicious. I actually love radishes, but I’ve never thought to roast them like this. I can’t wait to try this with my family! Just more proof for my theory that everything tastes better roasted. Not even roasting can make me like beets yet though. At first glance, they really did look like potatoes instead of radishes …lol. 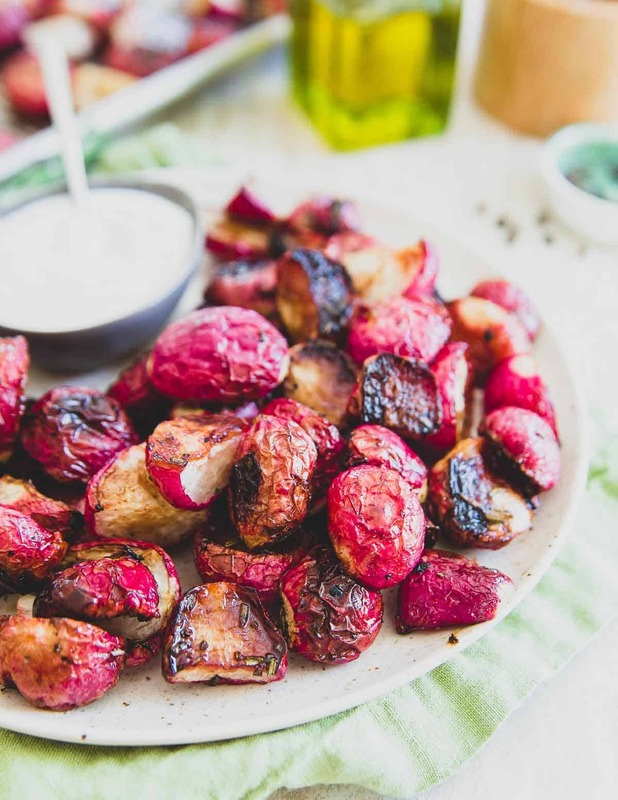 I barely eat radishes but i think i can eat these roasted ones! In my CSA I used to get a huge BAG of radishes every week. I never tried roasting them and would just chop them into salads and boy, that got…a little…old. haha. I need to try this b/c they look awesome! Yep! Totally thought they were potatoes! I don’t like raw radishes either, unless they’re sliced super thin and added in salads and stuff, but biting on big chunks, no. The taste is too strong for my liking. I love cooking veggies simply like this, it brings out the best in them. I just made red potatoes and loved them – incidentally, I just tried radishes and hated them! I’ll have to try treating them like potatoes – and with that delicious looking aioli, I have a hunch I’ll like them! I kind of like radishes just on the regular so I’m imagining I would really like these then? And they do look like potatoes. And that sperm in Look Who’s Talking…Ha! I forgot all about that. That dipping sauce is really what I’m interested in…I love a good dipping sauce. I love the idea of doubling up on veggies and these look so good. So…you’res splitting a CSA w/ Brandy, does that mean you get to see each other every week? Jealous! haha, actually we’ve been alternating pickups and dropping off at each other’s places b/c one of us is never around on the pick up days! So we haven’t seen each other at all! Wow, I might have to try this. I found out this fall that I adore roasted rutabaga and turnips. Why not radishes? I seriously thought those were potatoes. OMG i love it!! What a great thing to do with radishes. I never would have thought you could make that work. I can’t wait to try this and see what my family thinks! CSA time is the best. These look amazing Gina. I love rosemary. The idea of roasting radishes is totally new to me this year, I don’t know why I haven’t heard about it before. We actually like them raw, actually more like my husband and kids do. I’m OK with one or two for like, the year, lol. Since I have a ton in my garden, I know I need to try roasting them. They sound so much better than raw! Radishes raw are great but you can’t eat a whole pile of them. Cooked radishes, yes please! I haven’t roasted them so I’m excited to try this. I like sauteeing them in a little olive oil and butter then adding a little vegetable broth to braise and finishing them off with some parsley and lemon. Never been much of a radish fan but those do look delish! I really want to do CSA around here but I’m going to have research it more. I love the idea of farm fresh ingredients and I’m all about helping local farmers out. I definitely thought they were potatoes even though your title said radishes haha, the addition of rosemary with this is just perfect. I love rosemary with starches (is radish even a starch?). This would be a great side dish to have during a cookout! Hi.. Thank you for the recipe and the photos posted here because this is a big help.. I am sure a lot of people can benefit from this post.. Great job! I love radishes! Have never seen them cooked though. Will have to try, as long as they are still crunchy I am sure I will like. I cook radishes, too! That’s the only way my kids will eat them, so I’ve even cooked them and put them in a salad. Why not? They are better cooked, and roasting would be the best of all. This is my first time on your blog. I really like the flavor combinations you have put together! I do like radishes raw, but that is the only way I have tried them. It makes perfect sense to roast them. Totally gonna try this. I’m so glad I stumbled on this! We just got a bunch of radishes in our CSA, and I wasn’t sure what do with them, since they’re not our favorite veggie… I’ll have to give this a try! These were soooo good. I don’t have strong feelings about radishes either way, but do find them too spicy sometimes. These were perfect. A tiny bit sweet, a tiny bit spicy. I don’t know if I could trick myself into thinking these were potatoes, but I served them with potatoes for my husband, and I found myself getting a second serving of these rather than the potatoes! Can’t wait to make them again. Thank you for the recipe but I’m sorry to say these turned out sad and soggy for me. Maybe radishes just have too much water to be faux potatoes. I have actually just started to eat radishes in my salads! I love how long radishes survive in the fridge. And I actually find that sliced thin, I enjoy the flavor. Who knew? This sounds pretty yummy, though!